What is Health Literacy and Why Do We Need to Know About It? The term “health literacy” attracted my attention a couple of years ago when I was reading some work by the World Health Organization (WHO). The definition they were using for this concept of health literacy included not only having information about health and ways to access services but also having skills. Whenever I see “skills” highlighted I get excited. When information is coupled with skills the information is more likely to become practical and understandable. Plus, people are motivated to use the skills when the information they receive is compelling. Unfortunately, the kind of skills the WHO is referring to isn’t a skill like those we teach in the Social Resilience model (the RZone Skills). WHO is referring to skills like the ability to read and compute various health indicators such as a cholesterol ratio. It does provide a jumping off place, however. I think we can expand on the definition of health literacy in important and practical ways. First, a large number of us do not know much about the way our brain-bodies work. There are a myriad self-care techniques available “out there” but most of them show people how to use a technique (like meditation, pilates, or even healthy eating) without providing a why… the way that practice or technique specifically affects the brain-body. In our SRM training we do both. We provide information: the neuroscience concepts that shape the way the mind-body will work best and then offer the RZone skills that create the climate needed by the brain-body to operate most effectively. When people understand that the brain’s capacity to change itself (for better or for worse) is largely determined by what we pay attention to and for how long, the motivation to use skills like Sensory Tracking and Shift and Stay increases. The graphic at the left shows a version of the Skills Card that we use in our trainings. This one was for survivors of the earthquake in Nepal. The card presents the skills in a simple, pictorial way and can reinforce the skills and concepts after we have left. This is one way we build health literacy in groups of people who are experiencing the cascade of physical, emotional, cognitive, behavioral, and spiritual symptoms that so often follow traumatic events. We use the cards with all of our projects, adapted to reflect their culture and needs. Doesn’t it seem like a fitting expansion of the WHO definition of Health Literacy to include 1) information about how the brain-body works that affects health and well-being and 2) the skills anyone can use…children and adults, regardless of literacy level or educational attainment? 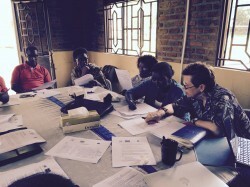 TGW has used the SRM information and skills across economic and educational levels and we have trained groups from many domains including the health care system, criminal justice system, and educational system as well as indigenous community leaders…in the U.S. as well as many other countries. Our focus is always to equip people from these venues to be SRM trainers. This provides both health literacy scalability and sustainability. In the past 3 years our focus has been to offer train the trainer programs rather than one time only training. This extends the reach of SRM dramatically as well as supporting people in deepening their skills and ability to develop creative approaches for the delivery of SRM training. 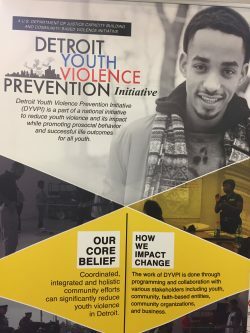 We recently completed a one year training program in Detroit with Project Ceasefire, part of the Detroit Youth Violence Prevention Initiative. Embedded in the police department, ten trainers are now spreading SRM across Detroit’s highest risk precincts. This is truly health literacy at its best! 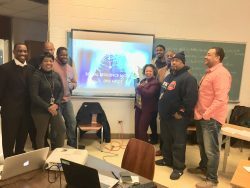 TGW currently has three projects in New York City that use SRM’s train the trainer model and link service providers with local community groups and the consumers they serve. The projects are multi-year and have a focus on justice-involved groups and changing the re-entry process in ways that build dignity and decrease recidivism. I’ll briefly describe one of these exciting initiatives, the New York City Health Justice Network (NYC HJN). This project comes out of York City’s Department of Health and Mental Hygiene (DOHMH) and is funded through the Criminal Justice Investment Initiative of the Manhattan District Attorney’s Office. Linking persons with justice involvement who are re-entering the community after incarceration, to high-quality, trauma-informed primary care and social services in their communities, the project has the goal of increasing health and well-being indicators as well as decreasing recidivism. TGW will be offering a train the trainer for health care providers as well as for community-based organizations and returning citizens. As the project grows I will be writing about our experiences, the challenges and the successes…both are important in refining a model of health justice in New York City. On a final note, watch for my chapter in the upcoming book by Drs. Traci Afifi and Gordon Asmundson being published by Elsevior. Using the authors’ description, “The book will be titled Adverse Childhood Experiences (ACEs): Using Evidence to Advance Research, Practice, Policy and Prevention and will include chapters written by many leading experts in the field. The current book will be a novel contribution to the field with the overall objective of using the current evidence to advance research, best practice, policy, and prevention. This aim will create a book that will be useful to health care professionals, social welfare professionals, policy makers, child advocates, knowledge users, researchers, and students.” My chapter discusses the contributions that neuroscience research makes to an understanding of adverse childhood experiences as well as in building resilience. And, furthering TGW’s goal of publishing articles that deepen understanding of vulnerable populations and their strengths, we have recently submitted two research articles for publication in peer-reviewed journals. The articles report on our (Kevin Barnes Ceeney, Lior Gideon, and myself) work with incarcerated genocide perpetrators in Rwanda. Our research explores health and well-being among this population (a sample of 302 prisoners, both men and women) as well as reconciliation potential. This research will, we hope, shape improved service delivery for these individuals; 55,000 are due to be returned to their communities in the next several years. And, we oversampled women genocide perpetrators in order to help build understanding of women who participate in genocide and their needs during and post-incarceration. This is a particularly underserved group and our research will add the currently meager database.